Supplement to Berlin's daily newspaper "Tagesspiegel"
The "TU Supplement" was published twice yearly from 2002 to 2013 at the beginning of each new semester in the form of an insert to the national newspaper "Tagesspiegel". This supplement was conceived by the Press, Public Relations & Alumni Office and produced in cooperation with the Tagesspiegel. 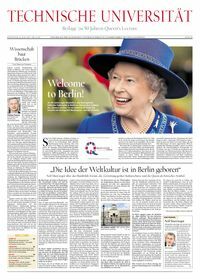 A special edition was published in June 2015 on the occasion of Queen Elizabeth II’s visit to the TU Berlin to commemorate the 50th anniversary of the "Queen’s Lecture". 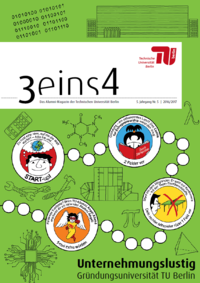 more to: Supplement to Berlin's daily newspaper "Tagesspiegel"
Our Alumni Program has its own magazine called "3eins4". This publication is also aimed at people in science, industry and the media. It deals with topics that touch on alumni issues, research, university news and startups. more to: Alumni Magazine "3eins4"
"parTU" was the magazine of the TU Berlin national alumni program. This publication was also aimed at persons in science, industry and the media. It dealt with topics that touched on alumni issues, research, university news and startups. In April 2012 the previously separate networks for national and international alumni were merged to form a new network that comprises all TU Berlin alumni living in Germany and abroad. 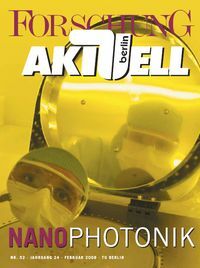 more to: Alumni Magazine "parTU"
The science magazine "Forschung Aktuell" is published once or twice each year and provides insight into our university's achievements in research. This publication is specifically tailored to scientists and researchers, but also university policy makers, industry and the media. more to: Science Magazine "Forschung Aktuell"
This supplement to the alumni journal "3eins4" was published once yearly in 2013 and 2014. It provided information about international guests and researchers who were spending some time visiting and working at the TU Berlin. (only available in German) more to: Print-Newsletter "Research-Alumni"